Every year it never fails. I send the boys off to school with brand new backpacks and at least two other kids in their class have the same one. What is a mom to do? There is only so much selection in our local area. Cue Gutzy Gear. 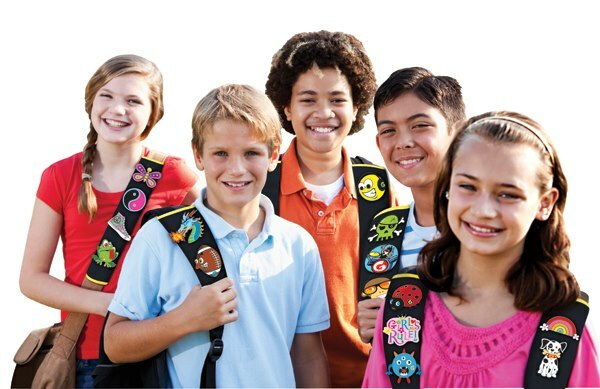 These awesome backpack accessories come with straps as well as tradeable Gutzies in a variety of patterns and styles. The cute Gutzies are attached to the straps and presto, an instantly customized backpack that is sure to stand out from the crowd. I picked up a few packs of the Gutzy Gear straps and Gutzy badges at BlogHer this year and they are perfect for allowing children to customize their back to school look. The ones I picked up where different styles of skulls, but they have a wide range of Gutzies that boys and girls can use to deck out their backpacks or even trade with friends. 5 Lucky winners will get the chance to experience Gutzy Gear products up close and personal in their own home. Gutzy Gear is offering 5 in home parties for up to 15 children each. During the Gutzy Party, the kids will receive tons of free products to deck out their backpacks, there will also be fun games and activities to play and recipes that the host can use to make the party perfect. Each in home party prize is valued at over $100. Giveaway will end August 31st at 11:59pm and is open to US residents 18+ only. Thank-you to MySillyMonkeys for organizing this giveaway. My son would love the soccer ball patch. My son would love the Spiderman Gutzie, or any of the Avengers! He'd also love the Three Eyes monster.